The escalating tension between the Spanish and Catalan governments wasn't the only dark cloud dimming the bright sun of Barcelona. I had planned three weeks of travel that would start in Portugal and end in Spain. However, the universe had other ideas and I missed not only one but two flights in two days. The first was definitely my fault, I woke up in my bed just as my plane to Lisbon was taking off. My body had muffled the numerous alarms I had set. The second, however, was a sign that I was never meant to make it to Portugal in the first place. I arrived in the airport with plenty of time to spare only to be told once I got to the check-in counter that there was a problem with my ticket that couldn't be resolved before the gate closed. My body was shaking when I left the airport and made the hour and a half long journey back to my bed. So even though my first day in Barcelona was a success when I woke up the next I was still sad about all that I had missed. Moping wasn't going to solve my problem so I packed up my bags and spent the next two days navigating the Gothic Quarter's serpentine streets. I hadn't wandered down streets this maze-like since my time in Amsterdam. Tiny streets would split in two one of which would often end in a dead end. You would round a corner only to end up in a massive square filled with people drinking. But I had no qualms about getting lost because everything was so beautiful. Exploring the Gothic Quarter started the process of getting me out of my funk but after a couple hours, I was starving. There was only one thing I wanted and that was paella, but with so many options and limited data on my phone I had no clue what was the best option. I found a street with a paella spot on every corner and choose the place with the best lunch deal. I got a series of small tapas and a medium size dish of paella. The rice was so succulent with just the right amount of crunch on the bottom. The seafood was a delight and I ate the whole thing faster than the time it took to make it. I rolled myself out of the restaurant and as the itis began to take over I knew nap time was imminentt. Before I could curl up in bed I stumbled upon an LGBT bookstore tucked away on a small street. Inside I found some local gay photography zines and added them to my personal archive. 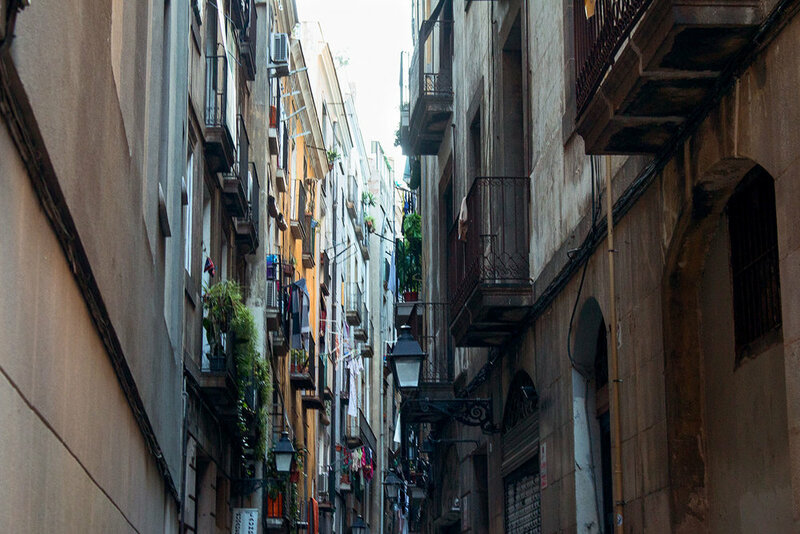 The Gothic Quarter is such a vibrant heart of the city of Barcelona. I can't wait to go back and see everything that I missed and have a cute photoshoot in the medieval cobblestoned streets. Make sure you subscribe below so you never miss an addition to the Archive! Sign up so you never miss an addition to the archive.